Stir together garlic and oil. Brush some of garlic oil on both sides of eggplant and season with 3/4 teaspoon salt and 1/2 teaspoon pepper. Grill, covered, turning once, until tender, 6 to 8 minutes total. Cut into roughly 1-inch pieces. Stretch dough into about a 12- by 10-inch rectangle on a large baking sheet and lightly brush with garlic oil. Oil grill rack, then put dough, oiled side down, on grill. Brush top with more garlic oil. Grill, covered, until underside is golden-brown, 1 1/2 to 3 minutes. Using tongs, return crust, grilled side up, to baking sheet. 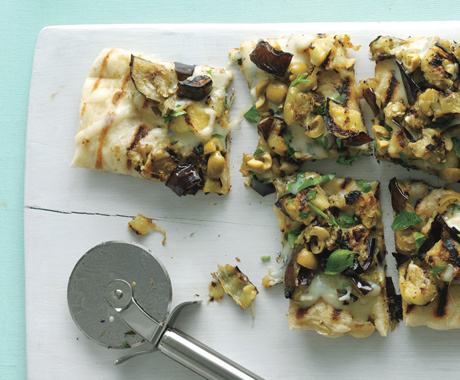 Scatter eggplant, cheese, olives, and parsley over crust. Slide pizza from sheet onto grill and grill, covered, until underside is golden-brown and cheese is melted, about 3 minutes.